Rihanna doesn’t hesitate to show her love for her favourite artistes. In St. Tropez she donned a Bob Marley t-shirt. 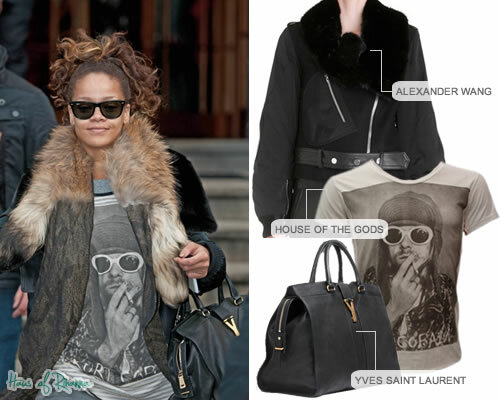 Most recently she was seen in a House of the Gods Kurt Cobain tee in Glasgow, Scotland. She also wore her Alexander Wang aviator tailcoat and carried the Cabas Chyc bag from Yves Saint Laurent, which retails for $1,995 on YSL.com. No look would be complete without black Ray-Ban Wayfarers.